King of Tokyo: a very popular dice game with elements of Press Your Luck. How far can you go? How long can you last? How much can you take? The press-your-luck genre is about putting excitement, tension, and player choice into what essentially is complete random chance. Rather than attempting to mitigate or balance out the luck of dice or the draw, press-your-luck gives substance to it. Any press-your-luck game has two sides to it; on one side, you have the buildup of points. Usually, the longer you continue risking, the more points you might score. The other side of this is the impending approach of failure. In most forms of press-your-luck, hitting the threshold of failure means you score no points at all, regardless of how many points you accumulated during your run of luck. The press-your-luck mechanism can be seen in its most basic form in the game Zombie Dice. In this dice game, players can roll the dice as many times as they wish, accumulating Braaainnnssss… but they also accumulate gunshot wounds. If they ever have 3 gunshot wounds, they lose any brains accumulated on the same turn. The player’s choice is simple: do they continue to roll and risk losing what they have, or play it safe and call it quits? The game is extremely simple, but creates tension through this simple choice. Well, I don’t have a picture of Zombie Dice (Martian Dice). 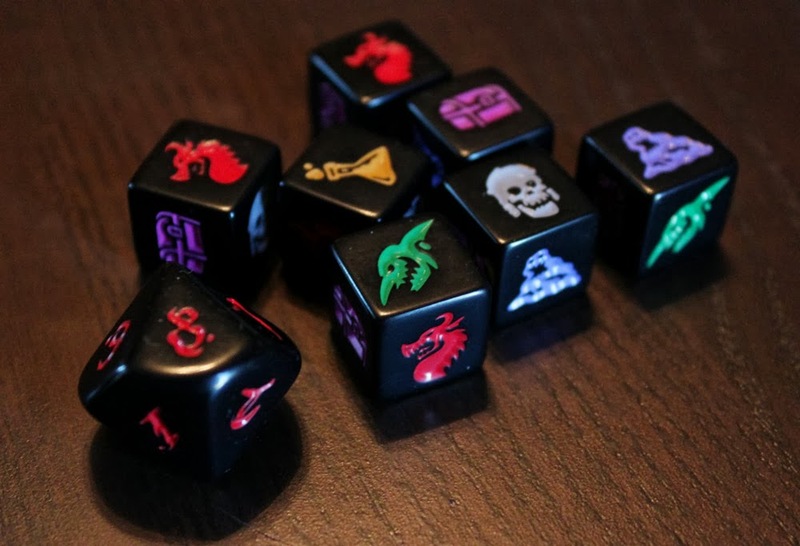 Dice are probably the most commonly used tool in press-your-luck games; after all, what feature of tabletop gaming is more luck-based than the roll of a die? Pressing your luck with dice is such a common element, hundreds of games use it as at least part of the games mechanisms, often as a way to increase tension, and it can be used in many different ways. For example, in Formula D, a dice-based racing game, players can opt to “shift gears” which changes the type of die used when rolling for movement. Higher gears increase speed, which is good for winning a race, but in certain areas along the track players must stop at the end of their turn or face dire penalties. Players can risk staying at high gears to pull farther ahead, but may find themselves driving too fast around a corner if they push too far. Can’t Stop allows players to roll dice as many times as they like, but must match totals of their previous rolls. Zombie Dice, as mentioned, is all about risking the chance of getting hit with three shotgun blasts while trying to earn as many brains as you can, but it gives you some information to help you decide the risk; differently colored dice have different amounts of risk. If you have a lot of green dice in front of you, even if they’re brains, you know you’re more likely to be rolling red dice on your next turn, which will increase your chances of getting taken out. Pressing your luck is not limited to dice, however. Many games use a sense of “location,” usually representing some sort of foray into a place with only one exit. Incan Gold is perhaps the most basic of this form of the genre; each round a new card is revealed. It may be trouble or it may be treasure, but players have to make only one choice: continue deeper into the cave, or leave. The game rewards players who stick it out longer than anyone else, but that’s assuming they last long enough to make it out themselves. The longer the round goes, the more likely the player is to be caught by the bad stuff, but warning signs will come out before that happens. Infiltration is similar in style, with a corporation’s headquarters replacing the ancient tomb, but steps up the complexity. A timer visible to all players counts up to 99, and players have until then to run around the building collecting data for points. The farther they get into the building, the better rewards can be collected, but it can take a long time to get that far, and as the game goes on the timer speeds up. This timer gives players information so that they can react and plan and make informed choices about when to risk and when to run, and it makes for an exciting, thematic experience. Other games use pressing luck as a partial element of the game, rather than the core of it. For example, Ra allows a patient (and risky) player to wait out his or her opponents, chancing that they may lose out on anything if the Ra track fills up, on the possibility that they will be able to claim a full row of valuable point tiles easily by bidding without opposition. Most of the game isn’t about pressing luck; it’s about balancing your bids with the value of tiles available–value that may be different to yourself and your opponents, but this press-your-luck element can add a lot of excitement. Tobago is a treasure-hunting game, where players get a piece of treasure for every piece of the map they put in to help find it. Players have the option of loading up a bunch of cards on one treasure map and thus have a chance to score big with exclusive access to a lot of treasure; but they risk drawing the cursed treasure, especially on a larger map with more cards involved, that could nullify a good portion of the treasure cards they would earn. It is important for any game utilizing press-your-luck to include a valid risk and a worthy reward. Risks should not always be successful, but the value of the reward should be worthy of the danger. After all, if there is no chance (or very little chance) of failure, there is no tension. And it better be possible to succeed on a risk, or players will soon learn to avoid risking at all, which also removes the tension. Tension is key to making press-your-luck a fun part of the gaming experience. Tobago has some elements of luck-pushing, although if the curse cards show up early, all tension is removed from later hunts. If there’s one overall drawback to press-your-luck, it is the possibility of sweeping failure or success. While the goal is to have an overarching balance between the risks winning and the play-it-safes winning, the basis of luck itself, which is not really controllable (otherwise it wouldn’t be luck), makes it entirely possible that the riskiest player will succeed gratuitously, or that the failure happens so quickly there’s no chance to even decide whether to risk or play it safe. A good example of this type of swing can be seen in the episode of TableTop featuring Zombie Dice. In the episode, the first player to take his turn has a wild run of luck and scores 10/13 points while barely breaking a sweat. As a result, the other players had little chance to catch up and were forced to risk even when it would be wiser to play it safe, and in some cases were cursed with poor luck ending their chances before they even started. Tension was essentially negated, since this first player could now take it easy and avoid any major risks for the rest of the game, needing only to score a few more points to win while the others were left far, far behind. Fortunately the game is a very short one. Push your luck to the next dungeon level in Dungeon Roll. In my own experiences playing Martian Dice, I’ve had games in which players rolled non-scoring dice turn after turn, which extended the length of the game. This didn’t create a runaway leader in our case, but it did take away from the experience as for many turns we rolled only tanks and death rays, having no chance to risk or play it safe, and what should have been a ten-minute game lasted three times as long. I’ve had games of Incan Gold where trouble showed up immediately and ended the round within five rooms, several turns in a row, making for a rather unexciting, low-scoring game. This sort of thing can happen. There are ways around it–to make press-your-luck less than the central element of the game, or to have the “failure timer” be more predictable or gradual (but not too much more–you don’t want to lose out on the risk). I love the way Infiltration handles the timer; a relatively predictable, but still variable, countdown timer (that ranges from 1 to 6 levels toward the 99 that end the game at the start) that increases (at the end of the game it is possible to see the “proximity counter” go up by 9-15 levels at once) over the course of the game. What’s more pressing than tempting the patience of the sun god himself? Press your luck as the primary feature of a game usually occurs in lighter fare, such as the dice-in-a-cup games Zombie Dice, Martian Dice, or Dungeon Roll, although it can step up a little bit in complexity as in Infiltration. In heavier, deeper games, press your luck tends to take a side seat to other mechanics, and is added to increase tension by adding a risk/reward element to a game. It’s certainly a viable way to make a heavy luck element in any game more exciting and something that goes beyond simple random chance that you watch unfold. Here are some of our recommendations for games that include Press Your Luck as a mechanism. Zombie Dice / Martian Dice / Dungeon Roll: These are the basics of the basics of press-your-luck dice games. Do you need all 3? Probably not. But its handy to have one of them around for those filler moments, and they’re all pretty portable. Can’t Stop: Can’t Stop is the quintessential hobby push-your-luck game. There is tension as players can keep rolling as long as they want, but if they can no longer move one of their markers, they lose their progress. The game involves a good deal of choice and lots of probabilities. Plus, the Stop sign-shaped board and pieces are cool. The fun comes in directly competing with the other players as you race to get to the top spots. You’ll also find yourself encouraging others to keep rolling against the odds hoping that they’ll bust. 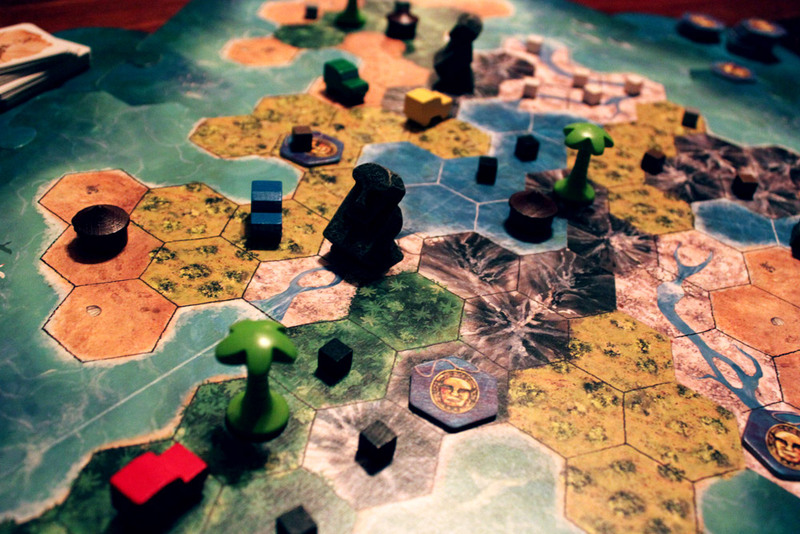 Incan Gold: Incan Gold is a great push-your-luck game for kids (okay, and adults). The theme comes across in the cool pieces, and the game centers around a binary decision: explore the temple further (and potentially lose your loot), or go back home, adding the treasure you’ve collected to your stash. It’s Fast, easy, has a fun theme, and can accommodate lots of players. 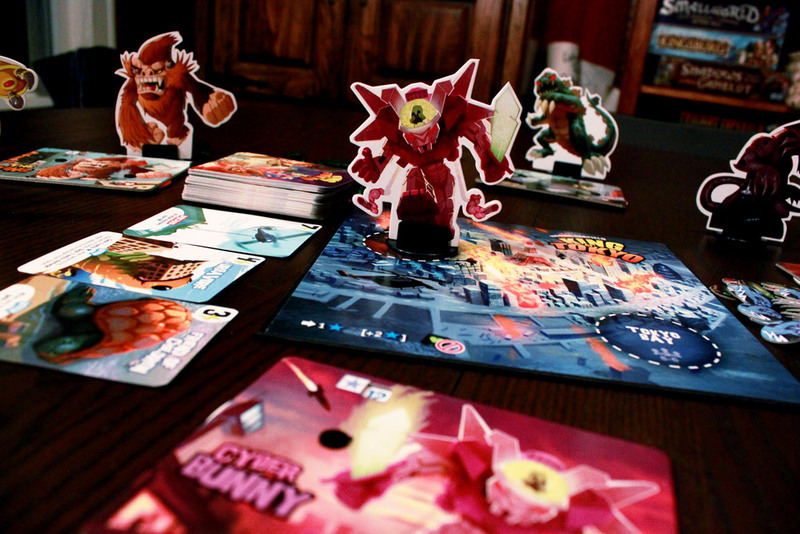 King of Tokyo: This highly lauded game from Richard Garfield deserves most of the praise it gets. It’s a highly thematic dice game, but the press-your-luck element is more about how long you stay in Tokyo. It’s colorful and fun and won’t drain away too much of your time. 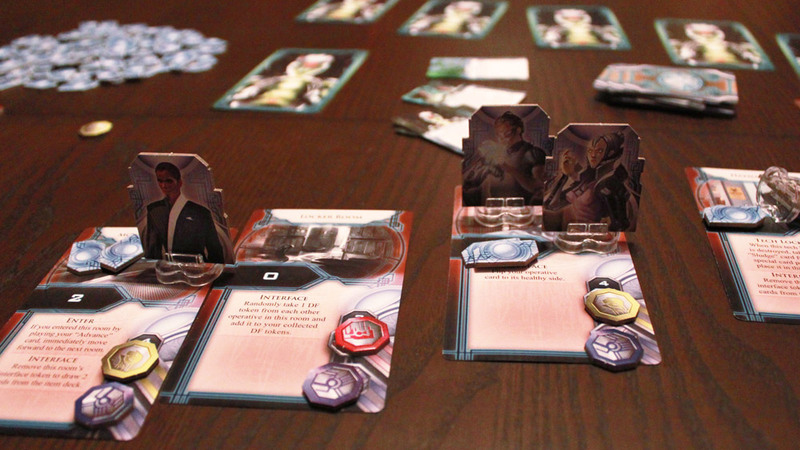 Infiltration: This is probably one of my most favorite press-your-luck games of all. I love the excitement and tension of pressing as far into the building as you can get. Items and special actions within rooms allow for different strategies and some awesome combinations, while the visible countdown timer allows both risk-taking and strategic planning. It’s exciting and has a great thematic icing. 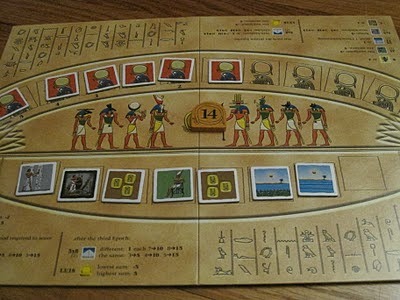 Ra: Though it’s not a straight-up press-your-luck game, Ra is one of @FarmerLenny’s favorites. You won’t be pushing luck every turn, but there are tense and exciting moments when pushing your luck can get you a huge score. Ra (and Medici, another game in Knizia’s auction trilogy) also have push-your-luck elements in determining what’s up for auction. Both games involve player choice in determining the lot, and both games involve lots being drawn from a bag. In Ra, there’s a real possibility that a lot will have its value destroyed by the disaster tiles; in Medici, it’s possible to draw the low-value tiles that will make the lot worthless. I love this tension even in deciding what to auction. Shame on me for not getting it in sooner. But hey! I talked about Can’t Stop and Incan Gold, so there’s that. I just assumed FarmerLenny would gush about Ra so I didn’t give a good description either despite it being my top recommendation. I like how Ra’s natural timing mechanic adds another aspect to consider when valuing auctions. It’s a push-your-luck game that doesn’t force you to push your luck if you don’t want to and still have a fair shot at winning.